October is here, which means Halloween is just around the corner. We have about 2 weeks left until Halloween, so it's time to start thinking about all things spooky and fun! Now that my kids are older they don't go trick-or-treating anymore, but that doesn't mean we still can't enjoy the fun of Halloween. For my teenagers instead of trick-or-treating now, it's all about dressing up, getting together with friends and handing out candy to the neighborhood kids. 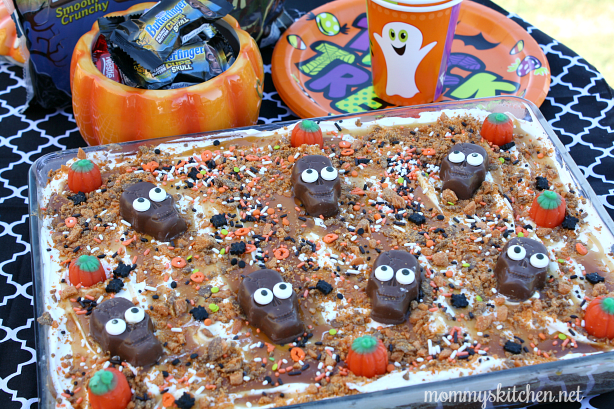 I always plan something fun, a themed dinner and scary movies are always a must to kick off Halloween and I always make a yummy dessert to end the night. It's usually something simple with a festive Halloween theme. 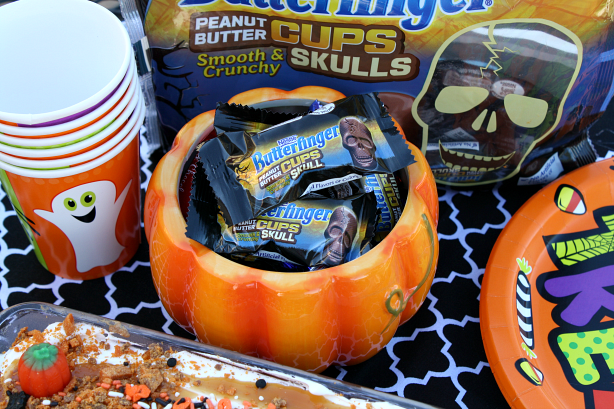 When Nestle approached me about creating a craft or recipe using their new Nestlé Butterfinger Peanut Butter Cup Skulls, I was totally on board and I knew exactly what treat I wanted make. Move over pumpkins and make room for the New Limited Edition fun size Nestlé Butterfinger Peanut Butter Cup Skulls! These fun size skulls have the perfect combination of creamy milk chocolate, smooth peanut butter and crunchy butterfinger bits all molded together in a fun spooky skull shape. Each fun size candy skull are free of artificial flavors and colors and come individually wrapped in a 10.8 oz lay down package with 18 skulls. These fun size skulls are the perfect treat for candy bowls, trick-or-treaters or to bake up a spooky Halloween themed recipe. 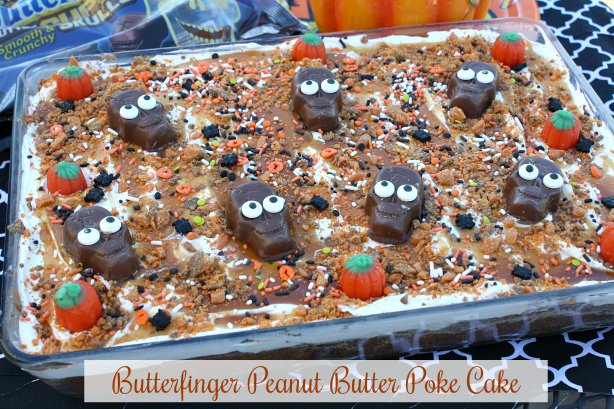 I love a good poke cake, so using the Butterfinger Peanut Butter Cup Skulls, I created a Butterfinger Peanut Butter Halloween Poke Cake as a special early Halloween treat for my family. Poke cakes are easy to make and the flavor combinations are endless!!!! 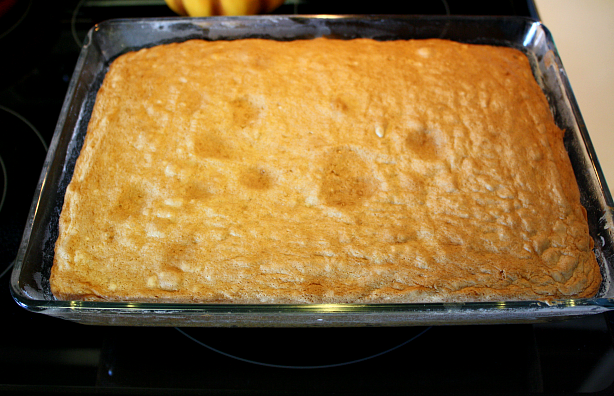 For this poke cake I baked up a yellow butter cake and added creamy peanut butter to the batter. 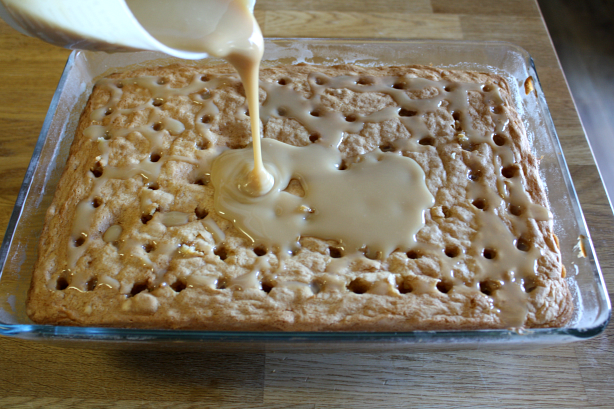 When the cake was finished baking, I poked holes all over the top and poured a mixture of sweetened condensed milk and a caramel sundae topping over the holes. When the cake was completely cool, I frosted it with whipped topping (fresh cream can also be used) and sprinkled crushed butterfinger bits on top. To finish off this festive cake, I added the Nestlé Butterfinger Peanut Butter Cup Skulls, candy eyes and some colorful pumpkin and spider sprinkles. 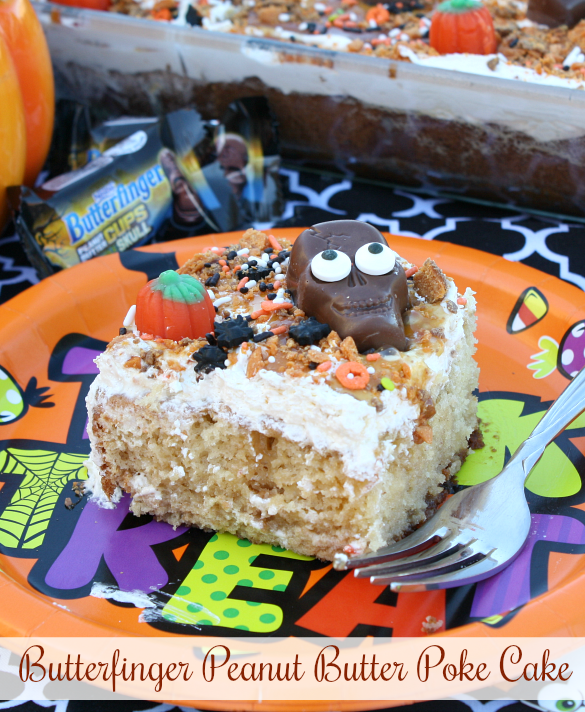 My whole family loved this spooktacular poke cake and I'm already thinking of new ways to use these adorable chocolate skulls. If you're looking for a quick and impressive dessert for your upcoming Halloween or fall celebration I think this is it!!!!!!!!!!!!!! Let's get started and I will show you how simple this cake came together. To start preheat oven to 350°F and prepare a 13 x 9 inch baking pan with non-stick baking spray and lightly flour pan (removing any excess flour). Prepare cake according to package directions, adding oil or butter, water, eggs and peanut butter and mix to combine. Bake cake according to package directions for a 13 x 9 inch baking pan (about 35 - 40 minutes). Uses a toothpick to test cake for doneness. Let cool for about 10 minutes. Poke holes in the cake using the end of a wooden spoon or something similar. 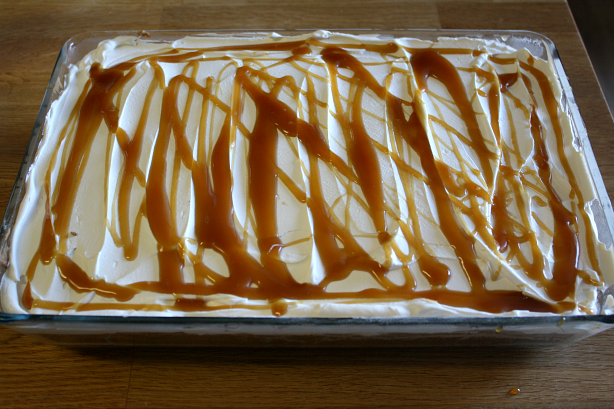 Mix the sweetened condensed milk and half a jar of the caramel topping together. While the cake is still warm, pour the caramel mixture over the warm cake making sure most of it gets into the holes of the cake. When the cake is cool, spread the whipped topping or fresh cream frosting evenly over the top of the cake. Drizzle the remaining caramel topping over the the cake. 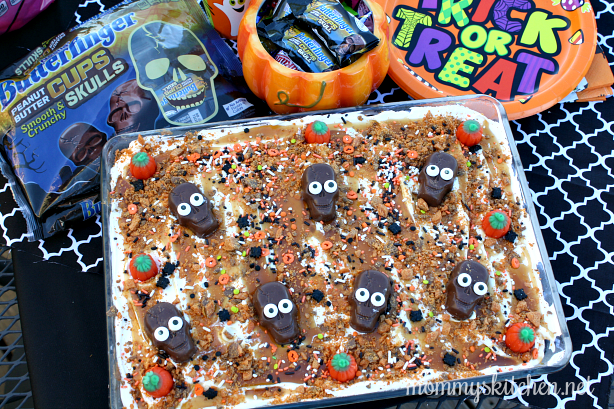 Sprinkle with crushed Butterfinger candy bar pieces and garnish with sprinkles, fun size Butterfinger Peanut Butter Skulls and candy eyes. Store cake in refrigerator until ready to serve. Store any leftovers in the refrigerator. I just know your family and friends will love this delicious festive treat. Nestlé Butterfinger Peanut Butter Cup Skulls can be found at retailers nationwide. Be trick-or-treat ready and grab a couple jumbo (220-450 count) variety bags of candy filled with fun size chocolate favorites from Nestlé Crunch, Butterfinger, Baby Ruth and Nestlé Milk Chocolate Bars, SweeTARTS, Nerds, & Laffy Taffy. Preheat oven to 350°F. 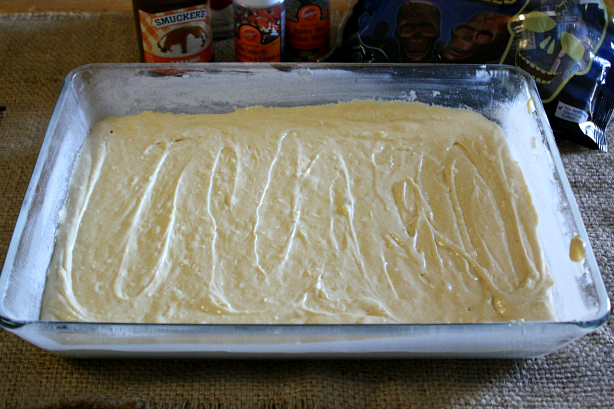 Spray a 13 x 9 inch baking pan with non-stick baking spray and lightly flour pan (removing any excess flour). Prepare cake according to package directions, adding oil or butter, water, eggs and peanut butter. Bake cake according to package directions for a 13 x 9 - inch baking pan. Use a toothpick to test cake for doneness. Let cool for about 10 minutes. 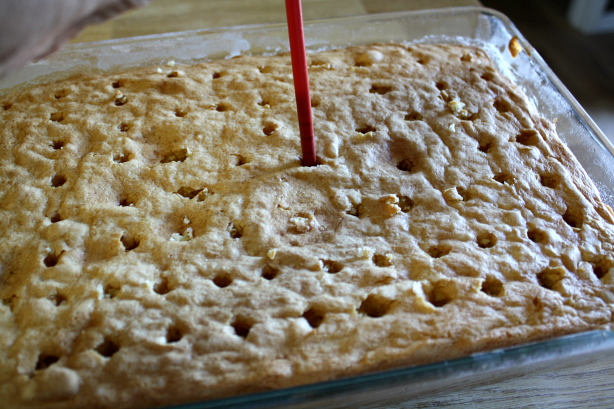 Poke holes in the cake using the end of a wooden spoon or something similar. In small bowl, mix the sweetened condensed milk and half a jar of the caramel topping together. When the cake is cool, spread the whipped topping or fresh cream evenly over the top of the cake. Drizzle the remaining caramel topping over the cake and sprinkle with crushed Butterfinger candy bar pieces. Garnish with sprinkles, candy and fun size Butterfinger Peanut Butter Skulls. Add the candy eyes to each Butterfinger skull. Store cake in refrigerator until ready to serve. Store any leftovers in the refrigerator. into a large bowl or stand mixer. Add 3/4 cup powdered sugar and 1/2 teaspoon vanilla extract. Whip the cream slowly over medium-high speed until ripples start to form. Turn off mixer and finish whisking by hand using a wire whisk until the cream starts to thicken and stick to the whisk. Frost cake with whipped frosting. 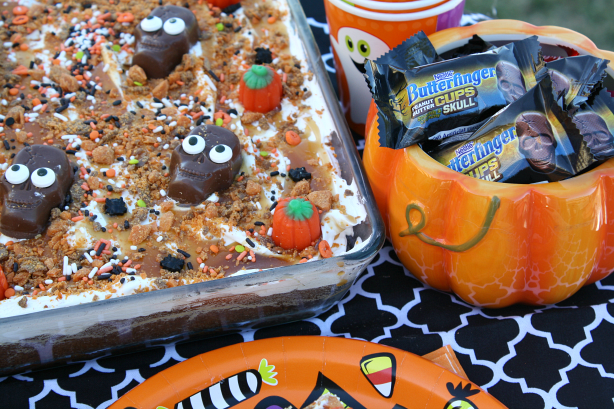 For more Butterfinger Halloween recipes stop by the Butterfinger Halloween Pinterest page and follow along on Facebook, Instagram and Twitter. I love how festive this Halloween cake recipe is. Way to get into the "spirit" of the season. Holy moly! I need this Butterfinger deliciousness in my life immediately. I have to head to the store today, and when I get back, this will be made! poke cakes are so fun and easy to make. You took this one up a notch. Love all the additions and the butterfingers are awesome. Oh man, that looks delicious. I love anything Butterfinger. I'll have to check this out in the future for Halloween cakes. I love the skull peanut butter cups. They look so cute. The poke cake looks really naughty. We will need a bunch of kids to come over and help us finish that. Hi adorable and yummy! What a great tradition you have every Halloween. Oh my goodness, now this looks like one yummy cake! I am totally coming over to have some lol! I love anything with Butterfingers on it...it is one of my favorite candy bars. That looks absolutely divine!!! Unfortunately I have to stay away from all sweets right now, which is going to kill be for Halloween and the upcoming holidays! Caramel is my favorite thing. LOL My kids would definitely love this. Maybe if I can maintain my resistance, I can make it for them only! This looks delicious and so much fun. It's perfect for a Halloween party! That's the cutest cake. Looks really yummy too. Yum! I love Butterfingers. The Carmel being poured into the holes of the cake makes it look soooooo delicious! Thanks for sharing. I will be bookmarking this one for the enxt time I make a cake! I like how easy the recipe looks. I think I know what to do with my niece now. She will surely enjoy the taste and the cute chocolate skull design. Oh my goodness this is SO fun for Halloween! I love that it's great for adults AND kids! Such a fun time of year, this is a great idea!